Yet another troll-fighting 11-year-old Orthodox Jewish Girl. 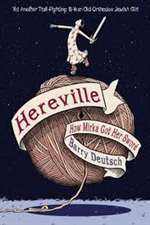 Mirka Hirshberg is a spunky, strong-willed eleven-year-old who isn't interested in knitting lessons from her stepmother, or how-to-find-a-husband advice from her sister, or you-0better-not-warnings from her brother. There's only one thing Mirka does want: to fight dragons!